Way back in 2012, I chose “The Platforming of Education” as one of my “Top Ed-Tech Trends.” Re-reading that article now makes me cringe. I have learned so much in the intervening years, and my analysis then strikes me as incredibly naive and shallow. At the time, I wrote about the importance of APIs; the issues surrounding data security and privacy; the appeal of platforms for users and businesses; and the education and tech companies who were well-positioned (or at least wanting) to become education platforms. I was inspired, I think, to select that topic because talk of “platforms” was incredibly popular in Silicon Valley – it had been for a while – as companies strove to become “the next Facebook.” And I wondered at the time if that would be the outcome for MOOCs. (2012, you will recall, was “the year of the MOOC.”) It was certainly the outcome that investors were hoping for Edmodo, which raised $25 million in 2012, boasting that it had 15 million users. Edmodo was back in the news this year when Vice broke the story this spring that hackers had stolen millions of account details, including usernames, email addresses, and hashed passwords. 70+ million users’ account details. I’ll look in more details at the insecurity of education data in the next article in the series – but recognize, this is one of the grave problems with digital technologies currently, whether they’re platforms or not: they rely on data as the central element of their business model – extracting data, controlling data, selling data… and far too often losing data during security breaches. It wasn’t a good look for Edmodo, which was discovered by privacy researcher Bill Fitzgerald that same week to be targeting users – students and teachers – with a range of ad trackers. Edmodo was one of the early stars of the most recent resurgence in ed-tech startup founding and funding (circa 2008 onward, that is). The company has raised some $77.5 million in venture capital from high profile names like LinkedIn founder Reid Hoffman and from firms active in ed-tech investing such as Learn Capital. Investors surely hoped that Edmodo would become a “social learning platform” – a central place for classroom assignments, assessments, and readings; a place for student and teacher collaboration in and out of the classroom; a site that third party developers (you know, other startups in investors’ portfolios) could install their apps and expand their reach; a system where student and teacher data could be collected, integrated, analyzed. Edmodo did garner a lot of sign-ups – all those millions of stolen usernames underscores that, no doubt – but it has struggled to do much more. It has struggled, most importantly, to find a reliable revenue stream or a “path to profitability.” As such, I think it’s fair to say that Edmodo hasn’t really become a powerful education platform, despite all the hope and hype. It’s not even an LMS, quite frankly – something Edmodo tried to use as a selling point for a little while. One might ask, I suppose, if LMSes are platforms. Are any education technologies, for that matter? But first, a definition (or two) might be helpful. A computing platform is the environment in which a piece of software is executed. It may be the hardware or the operating system (OS), even a web browser or other underlying software, as long as the program code is executed in it. Computing platforms have different abstraction levels, including a computer architecture, an OS, or runtime libraries. A computing platform is the stage on which computer programs can run. A “platform” is a system that can be programmed and therefore customized by outside developers – users – and in that way, adapted to countless needs and niches that the platform’s original developers could not have possibly contemplated, much less had time to accommodate. I’d love to provide a link but Andreessen deleted his blog in 2009. Someone generously re-posted all the content from that blog to a Posterous site. But Posterous, if you’ll recall, was acquired by Twitter in 2012 and shut down one year later. Platforms. They’re amazing. Andreessen’s definition does begin to get at some of the reasons why platforms have been so appealing to investors – ideologically as much as technologically. They’re supposedly “engines of innovation.” Those “countless needs and niches” can be met thanks to all the data generation and data collection that happens on them. platforms are digital infrastructures that enable two or more groups to interact. They therefore position themselves as intermediaries that bring together different users: customers, advertisers, service providers, producers, suppliers, and even physical objects. More often than not, these platforms also come with a series of tools that enable their users to build their own products, services, and marketplaces. …This is key to its advantage over traditional business models when it comes to data, since a platform positions itself (1) between users, and (2) as the ground upon which their activities occur, which thus gives it privileged access to record them. He argues that platforms can be characterized by their reliance on “network effects” – that is, the more people who use a platform, the more valuable and important the platform becomes. Think Facebook. As platforms gain more users, they tend towards monopolization. It’s a cycle, Srnicek argues, that then encourages more usage, which in turn generates more data. In his book, Srnicek identifies five kinds of platforms: advertising platforms (like Google and Facebook), cloud platforms (like Salesforce and Amazon Web Services), industrial platforms (like GE and Siemens), product platforms (like Spotify), and lean platforms (like Uber and AirBnB). In light of Hermann’s ominous description, one might feel inclined to celebrate that there really aren’t any powerful education platforms described in Platform Capitalism. To believe that would require, of course, that we overlook the role that the major technology platforms – Google, Facebook, and Amazon – play in education. So again: are there any platforms in or specific to education? If so, what are they? Arguably, one of the best candidates is the learning management system. The LMS has long positioned itself as an “operating system,” of sorts for higher education. The LMS constructs (and, I’d argue, circumscribes) “digital pedagogy,” and it has come to define the ways in which professors and students interact online. Indeed, while there are handful who work arduously to undermine its privileged position in education technology – god bless them – to many more, it is simply impossible to imagine a future of teaching and learning without the LMS. A couple of years ago, I was part of a year-end webinar with MindWires’ Consulting’s Phil Hill and Michael Feldstein and one or other of them – I don’t remember now – predicted that 2016 would be a big year for the LMS. I’m not sure it was, but then again, understanding the LMS industry is really their thing and not mine (something for which I am eternally grateful). It seems to me as though this year was pretty momentous too, if for no other reason than the open source LMS Moodle – first released 15 years ago and by far the most popular LMS in the world – raised its very first round of venture capital in October. Raising venture capital isn’t (necessarily) good news. Indeed, a few weeks after the funding news, Feldstein wrote about “Why Moodle Supporters Should be Concerned,” questioning the sustainability of the project. Perhaps that seems counter-intuitive to those not familiar with the machinations of investors and their expectations of an ROI. But raising venture capital can make a company’s prospects of sustainability worse. VCs, remember, are looking for “high growth” and “high returns.” And how much growth can we really expect in the size of the LMS market? For updates on the other major LMS providers – or at least, dispatches from their annual conferences, read Mindwires’ Consulting on Instructure, Blackboard, and D2L. Subscribe to their blog. Buy them a beer when you see them at an event and thank them for covering the LMS industry so I don’t have to. Investors, it appears, do still expect quite a lot of growth in the market, as learning management systems were among the types of companies raising the most venture capital this year. (Okay, okay. That’s because I now count AltSchool as an LMS. For more details on who invested in LMSes this year, see funding.hackeducation.com.) Perhaps this is simply because of investors’ long-running faith in the profitability of platforms – in these types of companies’ “funneling of data extraction into siloed platforms,” as Nick Srnicek puts it in Platform Capitalism. But for education entrepreneurs too, the LMS is an obvious product to build and sell (and brand oneself as). There’s an existing market there. No need to convince anyone of that. There’s an understanding – even if it’s a disgruntled one – among those in the classroom and those making procurement decisions of what the LMS is for, what it should do, and so on. I’ve joked before that “the arc of ed-tech history is long and it bends towards the LMS.” MOOCs looked – for a short while, at least – like they were going to pivot to become LMSes. (Instead, they’ve re-branded as job training sites. More on that in a subsequent article in this series.) Facebook’s partnership with the charter school chain Summit Public Schools to build “software that puts students in charge of their lesson plans” resulted in an LMS. (Product development was officially handed over to Mark Zuckerberg’s investment company the Chan Zuckerberg Initiative this year.) AltSchool, that high-profile darling of the Silicon Valley set – initially a private school promising “personalization” through a pervasive (invasive, even) collection and analysis of student data – also announced this year it would pivot to selling its software to schools. It’s now an LMS too. How technology companies are increasingly shaping the public sphere to suit their needs is one of the most important developments we must start paying closer attention to – particularly in education. It’s a theme that runs throughout almost every article in this series.“Fake news,” “robots coming for our jobs,” “the new economy,” “surveillance capitalism,” “personalization,” “the cult of innovation,” and so on – these are all narratives intertwined in the power of major technology companies, platforms, data, and algorithms. “They want to overhaul the entire chain of culture production,” former New Republic editor Franklin Foer cautions in his 2017 book World Without Mind:The Existential Threat of Big Tech. As such these companies – Google, Amazon, Facebook, Microsoft, Apple, and the like – are the most significant education companies. Education’s attention – and its anger – I think, has been focused elsewhere. 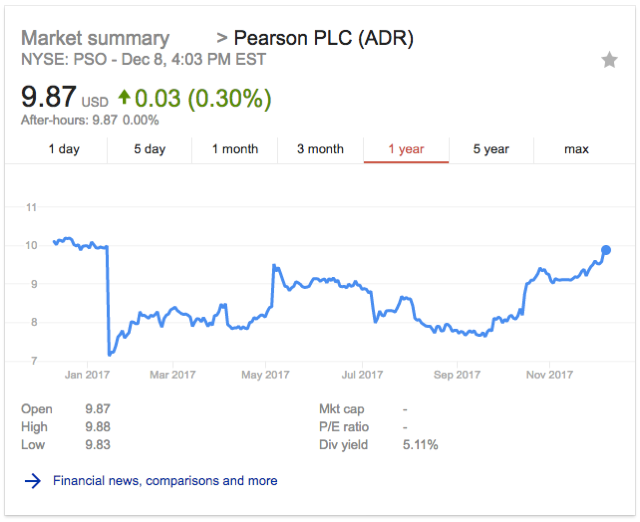 I’m not sure if we can still call Pearson “the world’s largest education company.” The last few years haven’t been good, with repeated scandals, job cuts, corporate losses, and ongoing attempts to convince us that the latest “restructure” is really going to fix things this time ’round. That restructuring has involved shedding some of the products and subsidiaries unrelated to education, Pearson executives have said. The company sold The Financial Times and its stake in The Economist in 2015, for example. And I’ll note here because it suits my argument about platforms so neatly: Pearson announced last year that it was leaving the learning management system market. Pearson does not have a platform. It has a lot of content – it’s still one of the largest textbook publishers. It still runs testing centers and has testing contracts. But Pearson is not a platform. Pearson represents an older business model – the conglomerate. 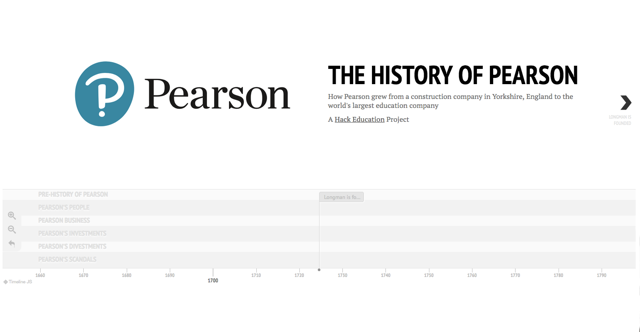 Pearson was founded in 1856 in Yorkshire, England as a construction company but expanded throughout the nineteenth and twentieth centuries to own newspapers, book publishers, airline companies, oil companies, electric companies – the information and infrastructure of the material world. Pearson has been – until recently, that is – an active acquirer of education technology companies. That’s how it’s attempted to make a move from the material world to the digital one. But it’s a content company. It’s a curriculum company. Since Netflix is a business and needs to survive, they decided not to pour the majority of their money into newer algorithms to better match people with the version of Big Momma’s House they would hate the least. Instead, they poured their money into making and obtaining things people actually wanted to watch, and as a result Netflix is actually useful now. In other words, it’s not the prize-winning algorithm and it’s not the recommendation engine and it’s not the predictive analytics that makes Netflix so vaunted lately. It’s the high quality content – “something that education technologists would do well to keep in mind,” I wrote then. Of course, for this to apply to Pearson, it would have to turn out high quality content. But how will content creators compete in a platform economy – particularly when the platform has exponentially more data? How will Pearson specifically compete if one of the most powerful platforms in the world is also in the book business? That’s Amazon, of course, whose interests in education remain perhaps less well-known than the other technology behemoths. Facebook: I addressed Facebook’s role in the building (or dismantling, rather) of knowledge in the first article in this series. The organization has also been, as I mentioned above, working with Summit Public Schools to build its LMS. And then there’s Mark Zuckerberg’s venture philanthropy firm and its commitment to fund “personalized learning.” But what did Facebook do? “New Facebook features intended for developers could, if expanded, turn the social networking site into an online learning platform,” Inside Higher Ed reported in June. “Facebook Giving Virtual-Reality Kits to Every Arkansas High School,” Education Week reported in August. “Facebook rolls out AI to detect suicidal posts before they’re reported,” Techcrunch reported in November. There’s no way to opt out apparently. This from a company that was found earlier this year to be enabling advertisers to target teens who felt “worthless.” In December, Techcrunch reported that Facebook would be launching a Messenger service for kids – those under the age of 13. Microsoft: “Microsoft launches Intune for Education to counter Google’s Chromebooks in schools,” Techcrunch reported in January. “Some colleges cancel their contracts with online education provider Lynda.com after double-digit price hikes, saying the company is pricing itself out of the higher education market,” Inside Higher Ed reported in January. “Microsoft’s new education push plays to its strengths, the cheap and familiar,” Techcrunch reported in May. “As LinkedIn’s Video Library Grows, Company Says It Has No Plans to Compete With Colleges,” Edsurge reported in June. “Now Any Organization Can Create Content for LinkedIn Learning,” Edsurge reported in June. “‘Schoolifying’ Minecraft Without Ruining It,” NPR reported in June. “Microsoft is really scared of Chromebooks in businesses and schools,” The Verge reported in June. “Microsoft Moves to Enable Streamlined Purchasing of Bundled Products for Education,” Education Week’s Market Brief reported in September. Apple: “Apple iPad Sales to Schools Jump 32%, Selling 1M Tablets in Fiscal Q3 2017,” Edsurge reported in August. “Ohio State collaborates with Apple to launch digital learning initiative,” the university announced in October. Students will receive iPads. Dear Jack: stop providing a platform for Nazis and maybe I’ll include you in a list of “powerful tech companies” some day. While there were obviously a variety of software releases and updates, the major efforts of Apple, Microsoft, and Google still involve wooing schools to buy their hardware. These devices, to be clear, provide the gateway to their respective platforms – offering access to software and also gaining in return a privileged sort of access to users’ activities – to users’ data. According to a report released by the market research firm Futuresource, Google’s Chromebooks accounted for 58% of the 12.6 million devices shipped to primary and secondary schools in the US last year – that’s up from 50% in 2015. Apple’s share of the market – which includes its sales of both iPads and Mac laptops – fell to 19% – down from about a quarter of the market. Microsoft Windows devices – again, that’s laptops and tablets – remained at about 22%. The problem might be more than simply limiting what students can do on their devices to note- and test-taking. It’s that these limitations in turn start to dictate what schools imagine students can and should do. How we imagine the future of teaching and learning is shaped by the constraints and affordances of a technology platform. By the data we surrender. But Amazon has begun marketing Alexa to schools, making a high profile donation to – you guessed it – ASU to place the devices in college dorms. “In a ‘first-of-its-kind’ partnership, Amazon is working with Arizona State University to create a voice technology engineering program, which includes an option for students to get customized Alexa-powered Echo Dots in their dorm rooms,” GeekWire reported in August. “ASU’s main motivation was to develop an opportunity for its engineering students to gain skills in voice technology, an emerging field,” a university spokesperson told Edsurge. Amazon’s motivation: to establish its voice-activated platform as the way in which people interact with the digital world. This isn’t simply about how the voice commands will be used in educational settings, of course – although you can now talk to Alexa and get some information in response about the Canvas learning management system, which I am certain is the ed-tech breakthrough everyone’s just been dying for. But it’s also an indication that the move towards a platform economy will increasingly implicate education in the practices of surveillance and in a pervasive culture of commercialism. As I detailed in the first article in this series, these technology platforms have an incredible amount of influence on knowledge and information – shaping what we see, what we know. As such, these platforms threaten not only to re-shape journalism, but to re-shape education. Their positions are already incredibly politically powerful. The tendency of platforms, as Nick Srnicek has argued, is towards monopolization: control of data and control of the governance. Google, for its part invests heavily in political lobbying. It is now the largest corporate lobbying spender in the US. Google also invests in think tanks, the policy and research institutions that are so prolific in Washington DC and so influential in turn in helping to shape policy and the narratives about the future. How is Google influencing policy? How is Google influencing research? In July, The Wall Street Journal published an article titled “Paying Professors: Inside Google’s Academic Influence Campaign.” Drawing on a list of names created by The Campaign for Accountability, the article accused Google of helping to finance academic research that would suit its needs legally, in particular defending it against regulatory challenges. The article came under fire almost immediately. Many scholars questioned the list of names altogether, challenging the contention that they’d been paid by Google for their work. Whether Google’s influence is direct or indirect, “it’s complicated,” Wired admitted. And one of the funders of The Campaign for Accountability? Google’s arch-nemesis, Oracle. In November, Fortune reported that Google was being investigated by the Missouri Attorney General John Hawley for violating the state’s anti-trust laws. Turns out that effort has ties to some of Google’s enemies too. Peter Thiel, an investor in several of Google’s key competitors including Facebook and his own data surveillance company Palantir, made a $300,000 political contribution to Hawley’s campaign. Monopolies are good for society, Thiel has argued. Unless they’re monopolies he doesn’t have a financial stake in, I guess. In his book World Without Mind, former New Republic editor Franklin Foer talks about the tech giants as “a new style of firm: the knowledge monopoly.” He admits, in a footnote, that his “casual use of the term ‘monopoly’” is likely to annoy economists and antitrust lawyers. It has a technical meaning, they will grump. “Oligopoly” might be a more accurate description of some of the markets I describe. These criticisms are fair but I am not making a technical argument. Indeed, I believe that technical arguments have strangled the discussion. My hope is that we revive “monopoly” as a core piece of political rhetoric that broadly denotes dominant firms with pernicious powers. This might not fly in the bar association, but such usage has a proud and productive lineage tracking back to Thomas Jefferson. The sweeping powers of these technology companies must be challenged, particularly as they turn their sights on public policy, public research, public education, and public infrastructure: Apple’s attempts to brand its stores as the new “town square” (and let’s do note: where those stores get built – who are the imagined consumer-citizens with access to this corporate-civic space). Google’s plans to redesign the waterfront in Toronto. Bill Gates’ acquisition of land in Arizona to build his version of a “smart city.” Mark Zuckerberg’s ongoing attempts to define “community” based on the roadmap for the Facebook platform, not to mention his plans to revive “the company town.” Amazon’s plans for a new headquarters, in which cities trying to lure the corporate giant to move there, offered up control over municipal taxation and decision-making – using “democracy itself as the bargaining chip,” as The Seattle Times’ Danny Westneat put it. One of the key questions that education technology’s evangelists must ask: are students and schools also being bent to serve those same needs? Are we compelling students to more become “productive” – through free labor, of course – on these platforms, not just as data points but as the very raw material that these companies are building their billion dollar businesses upon?